Check out the video below, of the Switzer Beast on the drag strip. Sounds mean. Lets see what it can do. The crew from Switzer Performance has just arrived at this year’s TX2K event near Houston, Texas- and they brought a little surprise with them in the form of the 2000 HP, ethanol-burning E2K Beast prototype- which you might remember as “Papa Smurf” from last year’s April 1st press release. Along with the Beast, the Switzer crew brought a few other familiar fascias, as well. 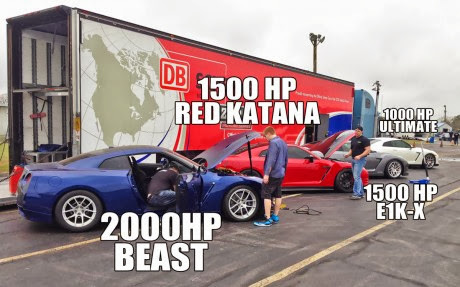 The 1500 HP Switzer Performance/Boulder Nissan E1K-X GTR (which has won this event before) and the 8 second Red Katana rocket ship.